We value the role that animals play in our community and we love to give back! Our first Puppy Kindergarten class was a major success! We had 4 puppies enrolled in the 8 week program. During that time clients learned about vaccinations, parasite control, dental care, and basic obedience. Puppies had a lot of time to play and learn that the vet is not a scary place to be! At the grand opening of the Buck Creek Dog Park we spent part of the afternoon giving away door prizes and administering rabies vaccinations. We enjoyed meeting new dog owners, watching the dogs play at the park, and supporting a project that so many volunteers worked hard to complete. Along side Royal Canin we were able to donate $1,600 in value of food to the Atlantic Animal Shelter and the Montgomery County Animal Rescue. 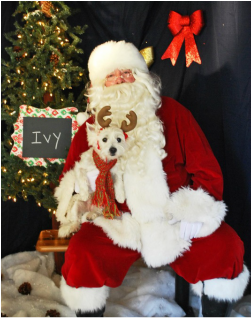 At Christmas time, we invite clients and community members to the clinic for a fun photo shoot with Santa! Free will donations have been used to support the Buck Creek Dog Park and Rusty's Fund. For the past two years we have Adopted and a flowerbed Downtown through the Adopt-a-Bed and Downtown Beatification project. We enjoy doing our part to keep our downtown looking spectacular.